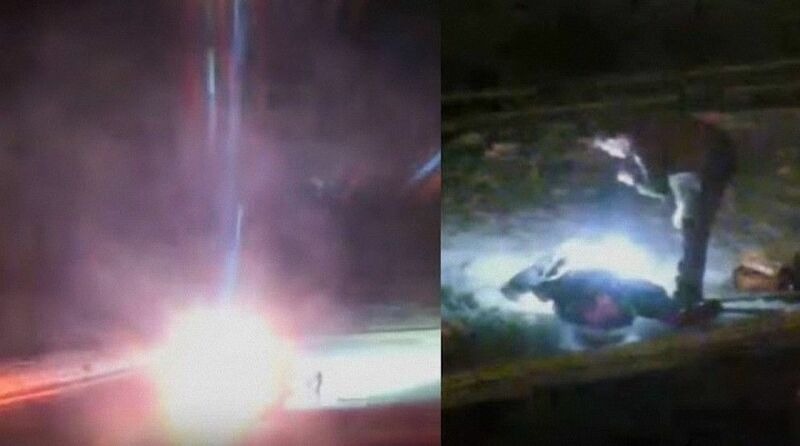 Home » Yellowstone Incident: Bright Sphere Explodes, Strange Dead Body, UFO Descends! Yellowstone Incident: Bright Sphere Explodes, Strange Dead Body, UFO Descends! A series of strange events have taken place in Yellowstone on April 21 and 22, 2018 and it looks like the events have been covered up. Next rangers bring aboard over to the area where the ground is all stirred up, then the footage shows the rangers shining a flashlight onto something strange on the ground. A person, an animal or a being but it doesn’t really look right to be a person. The next day a faint pillar of light going up in to the sky on the left side of the screen and a white triangle shape which was very defined appears, it started to sort of change shape a little and then what looked like a translucent bubble came from the far left and moved toward where the triangle was. After a few minutes, the white shape began to move downward until it disappeared behind the mound. It landed on the front side of the tree line. Shortly after that, a helicopter went racing by. That helicopter was looking for something, as it’s search light was on at low altitude and focused on the ground. One commenter confirmed that the morning after this they found a dead body in Yellowstone River and he said that if that body lying on the ground on the Old Faithful webcam was really a person or something else then maybe these two events are connected. First video shows the Bright Sphere, Rangers and dead body incident. Second video shows the translucent bubble and White Triangle Shape incident.